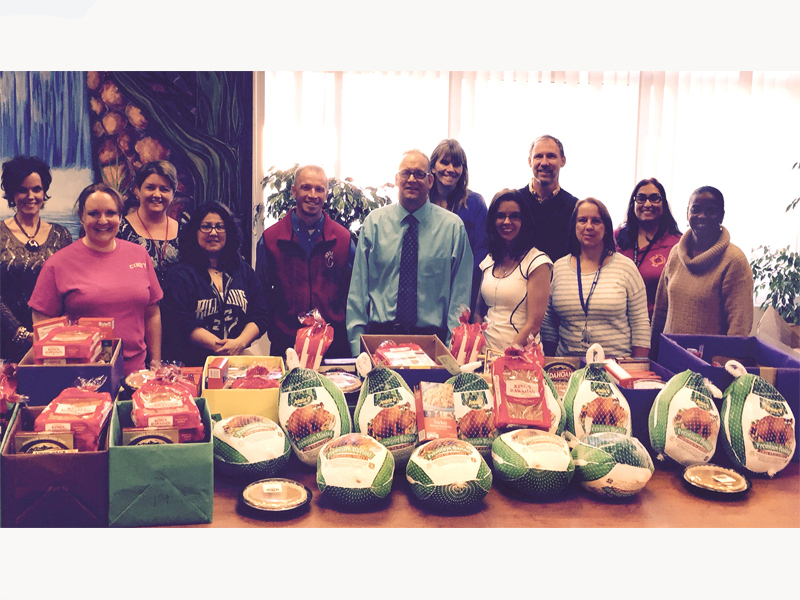 Thanks to the Cram Middle School Food Drive, 80 families received complete turkey dinners for this year’s Thanksgiving holiday. The turkeys were donated by the New Antioch Christian Church. There was also a generous donation from Dr. Rich Webster, a local orthodontist. Pictured, from left to right: Jura Leak (counselor), Cindy Smith (parent volunteer), Ann Green (parent volunteer), Heather Kukunaga (parent volunteer), Kevin Ferre (counselor), Gary Bugash (Cram MS principal), Amy Shimaoka (parent volunteer), Tamara Law (dean of students), Derek Fialkiewicz (assistant principal), Janice Smith (parent volunteer) Cassandra Jackson (counselor) and Claire Hart (dean of students). For more information, call Gary Bugash at (702) 799-7020.